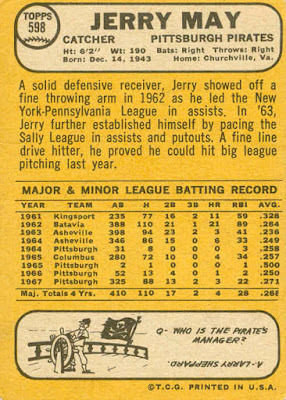 Ladies and Gentlemen, the last card in the 1968 set: #598 Jerry May! He had just completed his first season as the Pirates #1 catcher. Unfortunately for him, he would only hold that job for one more season, as Manny Sanguillen would take over the post in 1969. Jerry moved on to the Royals for 1971. 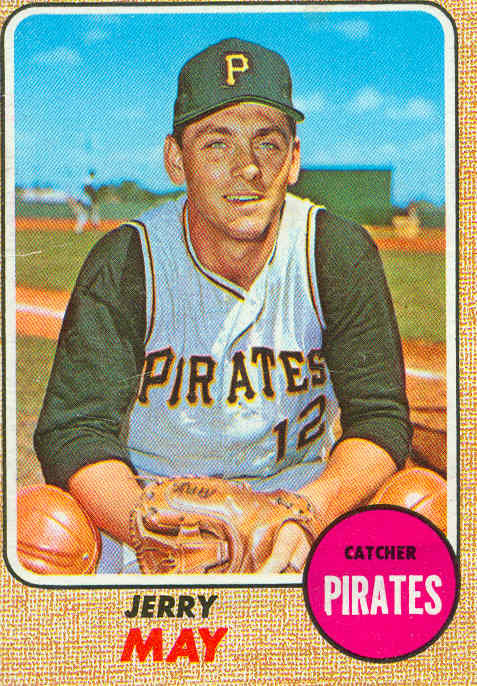 Although he made his big-league debut in September 1964, and played a few games in 1965, May didn’t stick with the Bucs until the start of the 1966 season. 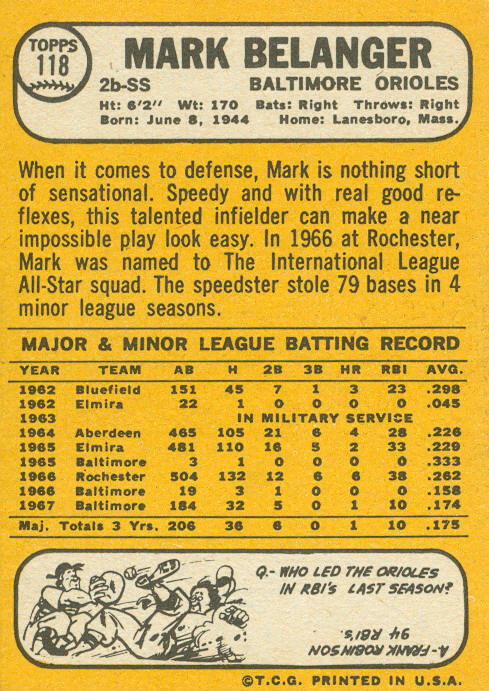 That year, he was the team’s 3rd-string catcher behind Jim Pagliaroni and Jesse Gonder. In 1967, May took over the starting role in game #10, and started 61 of the next 77 games behind the plate, with Pagliaroni as the main backup. Jerry missed all the games from 7/20 – 8/9, and with Gonder having shipped out in mid-June, the catching chores were handled by the veteran Pag and rookie call-up Manny Sanguillen during May’s absence. 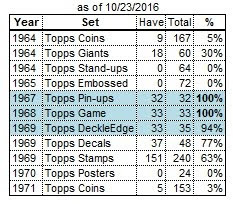 When May returned to the lineup on August 10th, he started most of the remaining games, with Sanguillen getting 12 starts. Manny spent all of 1968 in the minors getting the proverbial “seasoning”, so Jerry started 128 games in his final season as a regular. Pagliaroni had been dealt to Oakland in the off-season, so Chris Cannizzaro and Carl Taylor filled in behind May. 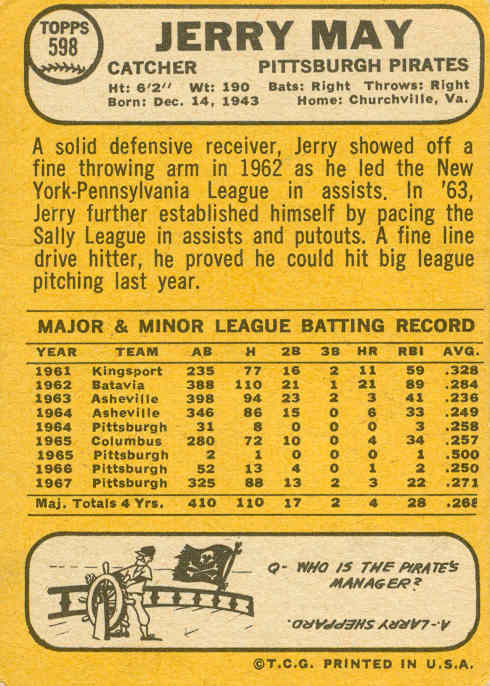 In 1969 Jerry made only 50 starts, as Sanguillen won the starting job in April. He found even less playing time in 1970, and after the season was traded to the Royals (with shortstop Freddie Patek and pitcher Bruce Dal Canton) for pitcher Bob Johnson, shortstop Jackie Hernandez, and catcher Jim Campanis. May split the catching chores in 1971 with ex-Angels’ outfielder Ed Kirkpatrick, and was Ed’s backup in 1972. Jerry started the first 6 games in 1973, but soon lost out to the tandem of Fran Healy and ex-Pirates teammate Carl Taylor. In mid-May he moved on to the Mets, who released him 2 months later after having played in only 4 games. The Pirates picked him up 3 weeks later and assigned him to their AAA team for the rest of the season. In January 1974 the Twins purchased his contract, but Jerry never played after 1973. May died in a farming accident in June 1996 at age 52. 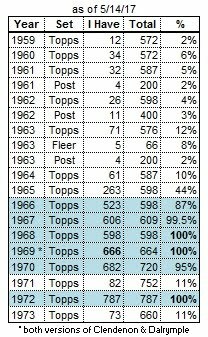 Topps has his position as 2B-SS because that was his position during his rookie year of 1967, when he played 69 games as a backup for 2nd baseman Dave Johnson and shortstop Luis Aparicio. Once Aparicio was traded back to the White Sox in November 1967, Belanger was the team’s regular shortstop from opening day 1968 until giving way to Kiko Garcia in 1979. 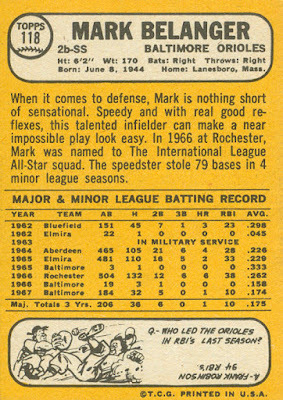 Mark was signed by Baltimore in 1962, and played in the minors from 1962-66 (missing the ’63 season to military service). 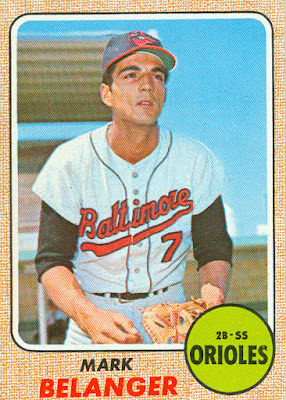 He played a few games with the Orioles in ’65 and ’66, then made the team for good at the start of the 1967 season. Belanger took over the shortstop reins in 1968, winning 8 Gold Gloves in the 10 years between 1969 and 1978. He made the All-Star team in 1976, and played in the post season 6 times (’69, ’70, ’71, ’73, ’74, ’79). Always a light stick (only 20 homers in an 18-year career), he hit a home run in his first post-season series (the ’69 ALCS vs. the Twins). After sharing the job with Garcia in ’79 and ’80, and with Len Sakata in 1981, Belanger was granted free agency in the off-season. He signed with the Dodgers and played his final season (1982) as a backup in LA. He played 44 games at shortstop, including only 12 starts behind long-time regular Bill Russell. Mark retired with the highest fielding percentage (.977) of any AL shortstop. After his playing career, he worked for the players’ union. Belanger passed away in October 1998 at the age of 54.